Given that less than 1 percent of our nation’s population has served in the military, it stands to reason that few people know about the benefits of service to their country. Each year, the Army opens its doors nationwide to teachers, guidance counselors and coaches to improve their knowledge of Army education and training opportunities. The New York City Recruiting Battalion recently hosted an Army Educators Tour at Fort Hamilton, N.Y. for 16 educators from Long Island and the five boroughs of New York City. “Educator tours are a vital outreach program for the Army to showcase both its commitment to supporting today’s educators and its commitment to supporting today’s students toward high school graduation,” said Tony Castillo, U.S. Army Recruiting Command (USAREC) Education Division Chief. Fort Hamilton Garrison Commander Col. Eluyn Gines told the group that continuing education is required in the Army. 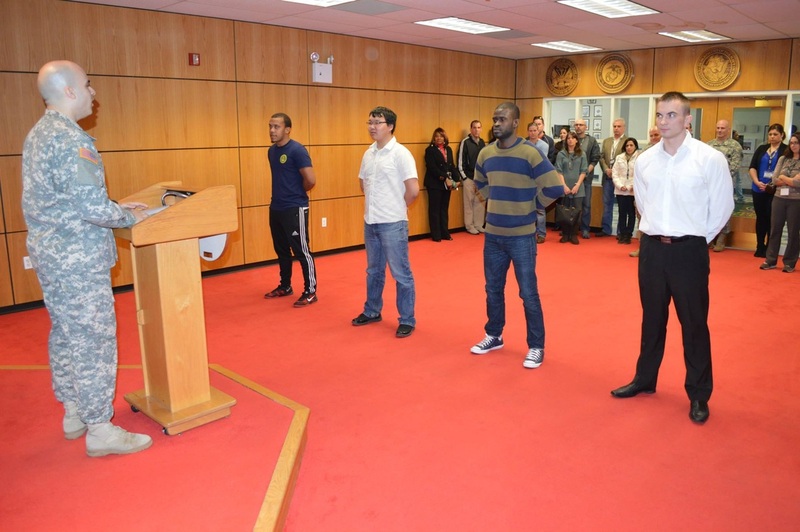 Educators toured the Military Entrance Processing Station (MEPS) and witnessed a handful of new recruits take the oath of enlistment. MEPS Education Services Specialist Vivian Moss explained that through the Armed Services Vocational Aptitude Battery (ASVAB), career counselors could use the ASVAB scores as strengths in certain areas to help create a career path. The Career Exploration Program (CEP) assesses each applicant’s ability to learn new skills in eight areas. Only one teacher in the group had experience with employing the ASVAB/CEP as a tool to help students determine their career interests. The educators continued the tour through military housing to experience first-hand what the quality of life is like for Army families. The benefits for Soldiers living in military housing include the increased security and reduction in crime associated with living in a gated community. Homes with garages eliminate the need for off-sight storage each month for larger families, and all Soldiers living on post have unlimited, free parking outside their homes. For Claudia Paula, a Flushing High School guidance counselor, taking the tour helped her uncover all that the Army can offer her students. The savings from the tax-free shopping at the Fort Hamilton commissary and Post Exchange adds up. Dollar for dollar, educators noticed a savings on their favorites: groceries, electronics, fashionable items, and gasoline. Before a catered lunch, the educators toured the post physical fitness center. Many were surprised to see two floors filled with exercise equipment that included, free weight, fitness equipment, recumbent bikes, treadmills and a host of cardiovascular equipment. The Army Morale, Welfare and Recreation facility includes fitness classes and more personalized attention such as Reiki, nutrition and personal training assessments. The tour took a midday break at the historic Fort Hamilton Community Club, where the 1179th Transportation Brigade commander spoke. Col. Sherry McCloud shared her Army story: that as a college graduate from South Carolina State University, she decided to join the Army. She now has two masters degrees paid for by the Army. For 70 years, the Army has been serving as a creditable partner in the education of Soldiers. Today, the Cadillac of education bills, the Post 9-11 GI Bill, empowers Soldiers and veterans across the nation to take charge of their futures and secure that college education as an intangible lifetime benefit of military service. Visit New York City Recruiting Battalion’s Facebook page for more Ed Tour photos and other activities in their Battalion, by clicking here. CEREMONY: Area educators had the opportunity to watch a live swear-in ceremony officiated by 1st Lt. Ismael Batista, assistant operations officer, Military Entrance Processing Station located at Fort Hamilton, N.Y. on March 20, 2014, during the New York Recruiting Battalion Educator's Tour. 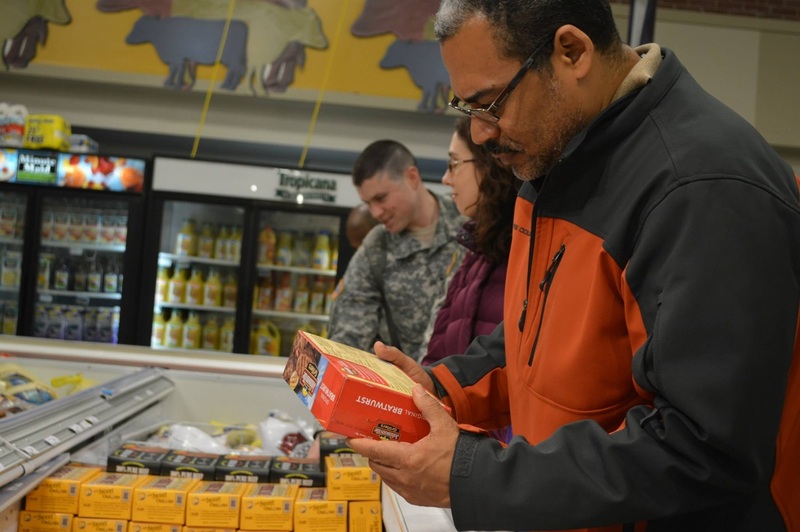 COMMISSARY: Educators and Soldiers took an interest in the frozen-foods section at Fort Hamilton commissary. Martin Young, an educator from the Cultural Academy of Arts and Sciences in Manhattan, Capt. Michael Gallucci, commander, Queens Recruiting Company and Harrison High School Guidance Counselor Renee Katzenberger looked at all the selections. The visit to the commissary was part of an educator's tour hosted by New York City Recruiting Battalion.